Say aloha to the pineapple Christmas tree! This fabulously festive social media trend is sure to bring a little joy to your holiday season and can be made with a few simple steps. 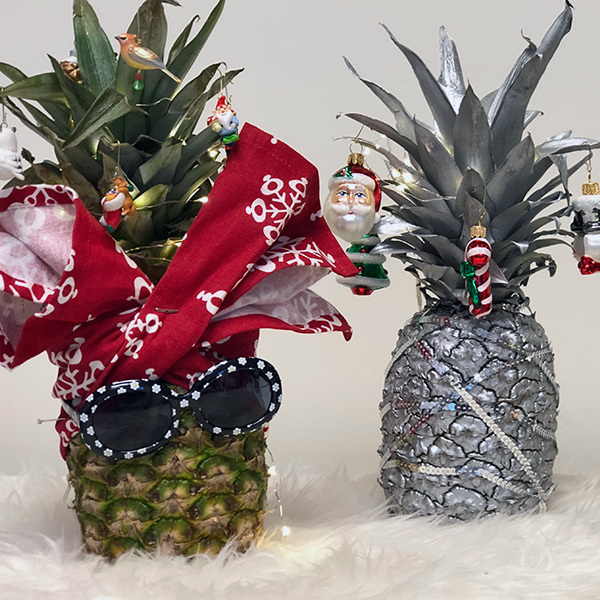 Add a pineapple Christmas tree to the buffet at your next holiday party or bring some tropical sunshine to your desk at work. Whatever you do, make it fun. Mele Kalikimaka! Not just any pineapple will do for your tiny tree. Be sure to pick a pineapple with lush crown – that is the green part at the top. Avoid crowns that are trimmed too short or have turned brown and wilted as they will not be able to support your decorations. Note that your pineapple Christmas tree will likely last a week at most. Retro – Get some classic retro ornaments and paint the whole pineapple a beautiful silver. Pink Lady– Paint the base pink. Throw on some sassy shades. String the lights around the crown. Tiki – Double down on internet trends and add a tiki theme to your pineapple. Add some glasses, flamingos, and other classic tiki icons. Decorate while the scent of pineapple whisks you off to the Pacific. Monochromatic & Classy – Get some gold paint, gold glitter, and twinkly lights or spray paint it all white and drop some fake snow and porcelain ornaments for a winter wonderland. Christmas Lights – These tiny Christmas lights work perfectly and you can put them on a timer. Ribbon – Add some color to the crown or wrap it around the whole fruit. 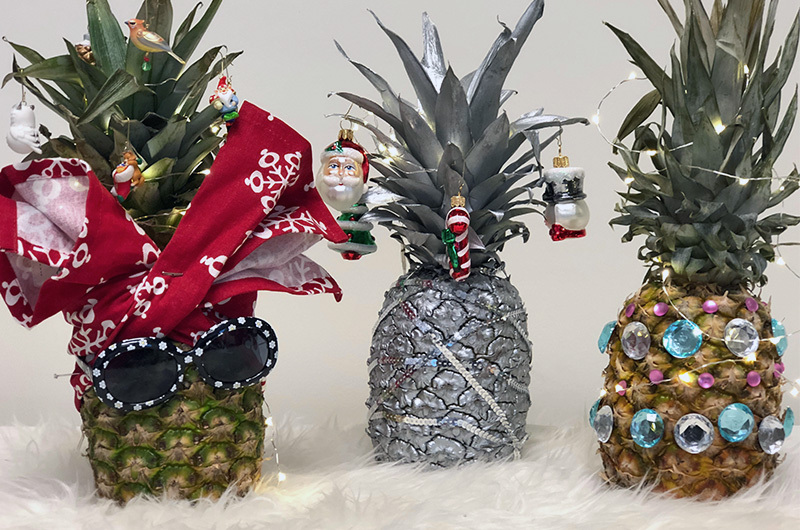 Glitter & Jems – Bring some Christmas glam to your pineapple. Add some glitter or grab some plastic jewels and attach them with hot glue. Tree Topper – Yes, you can add a star or an angel with a little wire. Sunglasses – Many of our friends online have added some classic shades to give the tiny tree a sweet face. We are also tempted by glue-on googly eyes. Tree Skirt – A tea towel is the perfect size to wrap around your Christmas pineapple. Top the crown with ornaments. Teeny Nutcracker – Sugar plum fairy pineapple anyone? A World within a Pinecone – A tiny scene carved into a tiny ornament perfect for your tiny tree. Think about it. Three Hallmarkers took to Facebook Live to demonstrate how to make a pineapple Christmas tree. See the craft in action and get some tips below.